One thing that we tend never to have enough of is jumpers and cardigans so when I was in Morrisons recently I could not resist buying a jumper with Hello Kitty on it which I found on the sale rack. I have to admit that despite almost always finding clothing that we love at Morrisons it is a shop that we all to often forget about (our closest store does not stock any and they don't sell online unfortunately). 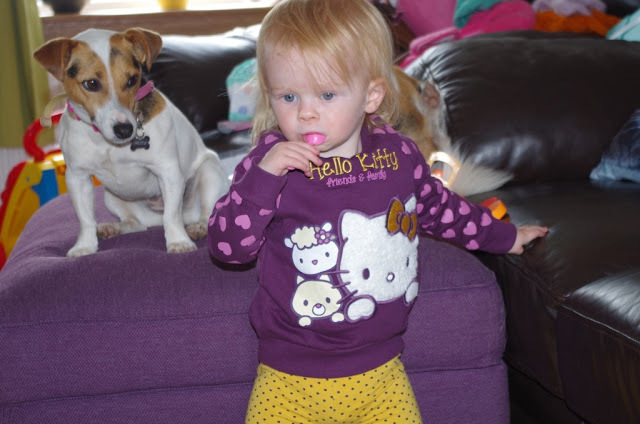 I love Hello Kitty and have always snapped up clothing that features Hello Kitty on it but what I really loved about this jumper was the purple colour. As I say this was in the sale and so for £4.50 we got a superbly made jumper. The quality is great. I got the 12-18 month size and this fits M perfectly which I would say means it is smaller made than many shops as she tends to only wear 9-12 months for jumpers. That said I can see her wearing this a lot over the next few months so we have definitely got our money's worth with it (I know it is summer but we live in Scotland!). The sleeves of this has lilac hearts that are printed on and the two smaller characters at the front (Rory and Fifi) are also printed on. Hello Kitty herself is embroidered on and filled with fluffy "fur" material and has a gold sparkly bow. The text at the top of the jumper is also embroidered on. Overall I think this is a great quality jumper and would easily have paid more than what I did to buy this. George at Asda - Part of a multi pack that we were gifted for her Christmas so no longer for sale. 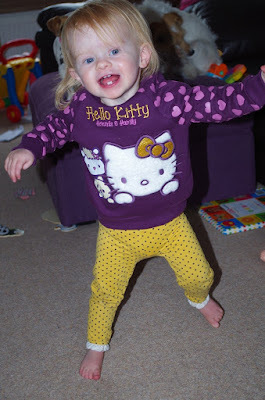 Leggings are a staple in M's wardrobe but we love these ones as mustard is not a colour we have really ever chosen for her. The bottom of the leggings have a pretty frill that I think add to the overall look of the legging and just make them really girly. I also love the black dots on these. Love the second photo, haha. Jumper is fab my daughter would love that, she a hello kitty fan too. 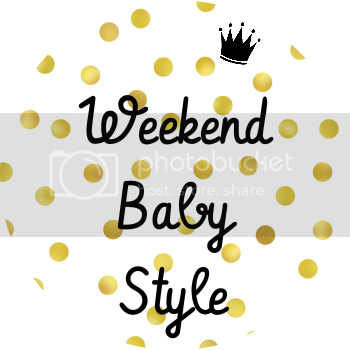 We don't live close to a Morrisons that sells clothing but wish we did as I find the clothes to be great value for money! Yeah I love mustard on her! We don't live close either really, luckily I was in Glasgow for something else and it was next to one so I popped in as I was early or we would never have seen these!